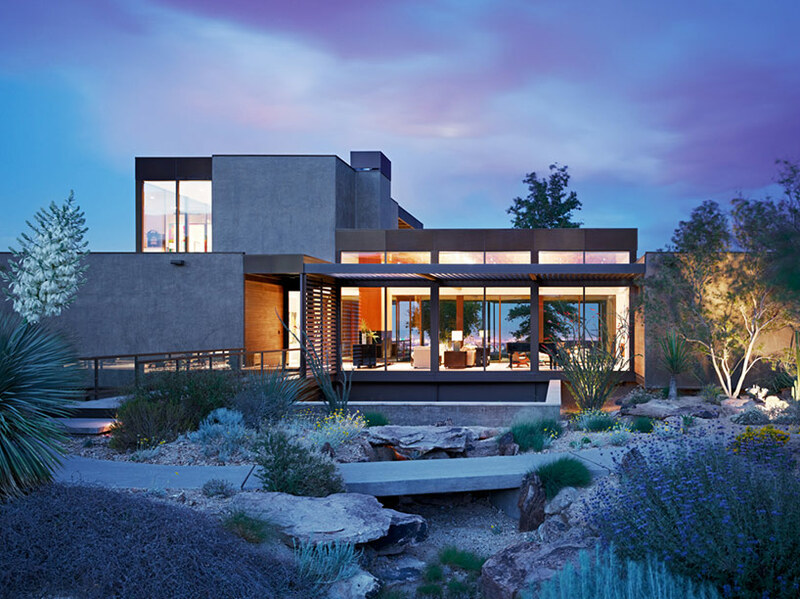 LA-based studio marmol radziner has shared images of their prefabricated las vegas house completed in 2009, overlooking the city of lights from a nearby hillside. 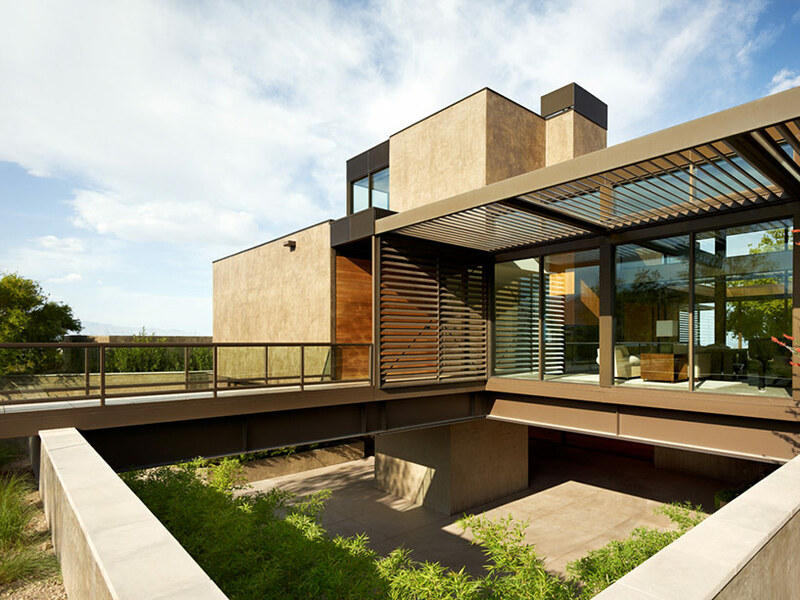 the house is comprised of 36 prefabricated steel frame modules – 24 for the interior construction and 12 for exterior structures – and were assembled off-site concurrently with the complex foundation work being poured on site, making the entire construction a speedy 12-week endeavor. 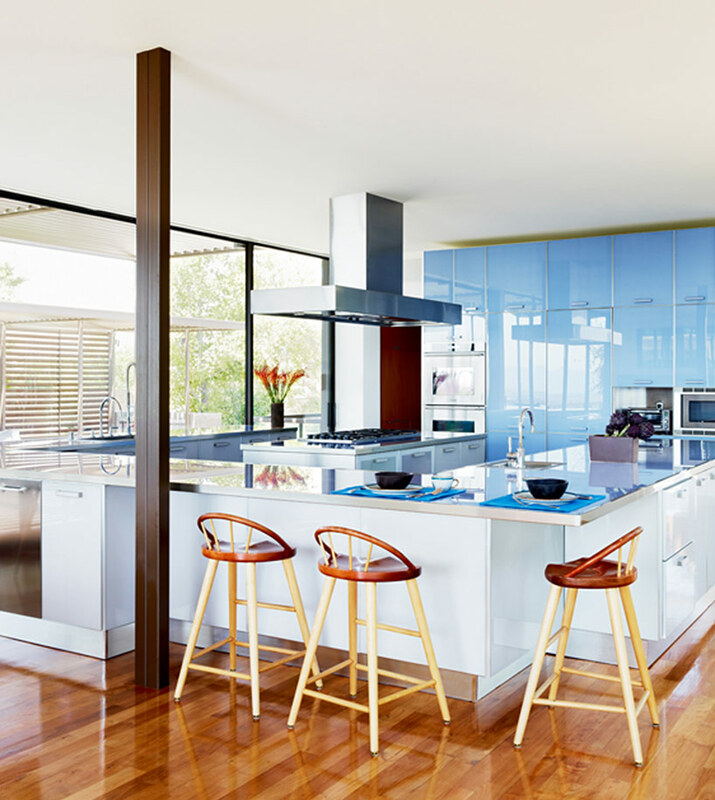 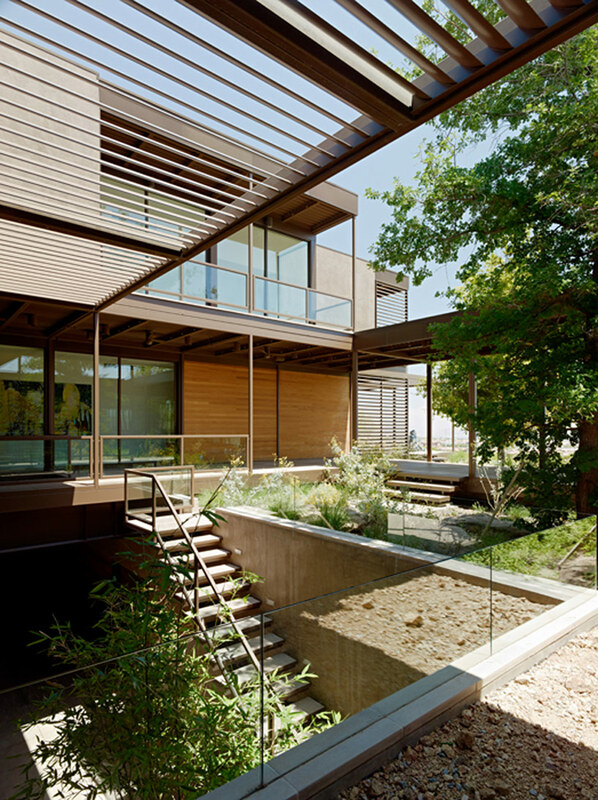 partially buried into the ground, the home takes advantage of the earths naturally cool thermal mass to help insulate the home, along with deep patios that help control the amount of direct sunlight that hits the interior. 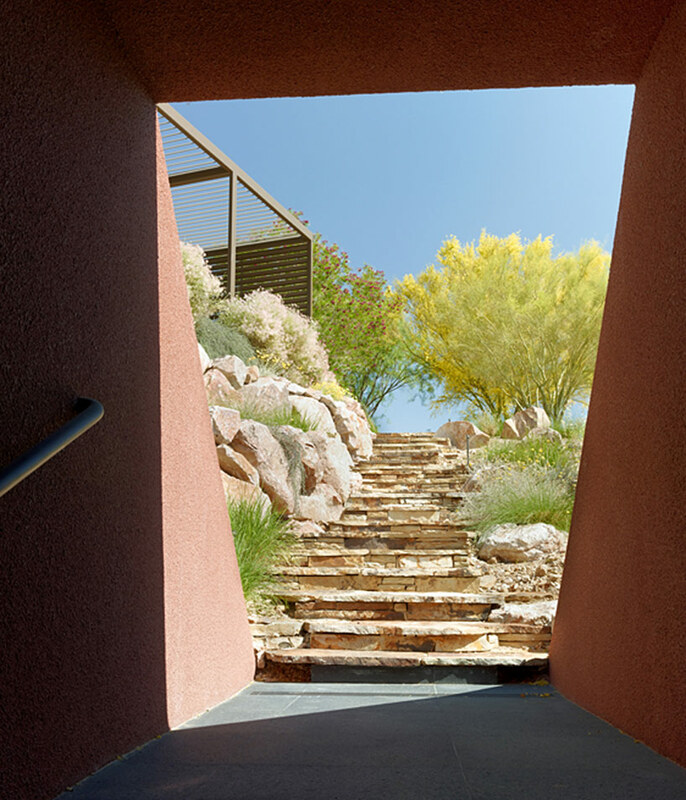 overall, 18,000 square feet includes four bedrooms and five bathrooms, a spa, pool, a series of partially covered and uncovered patios and courtyards, and a pyramidal ‘skyspace’ designed by light artist james turrell. 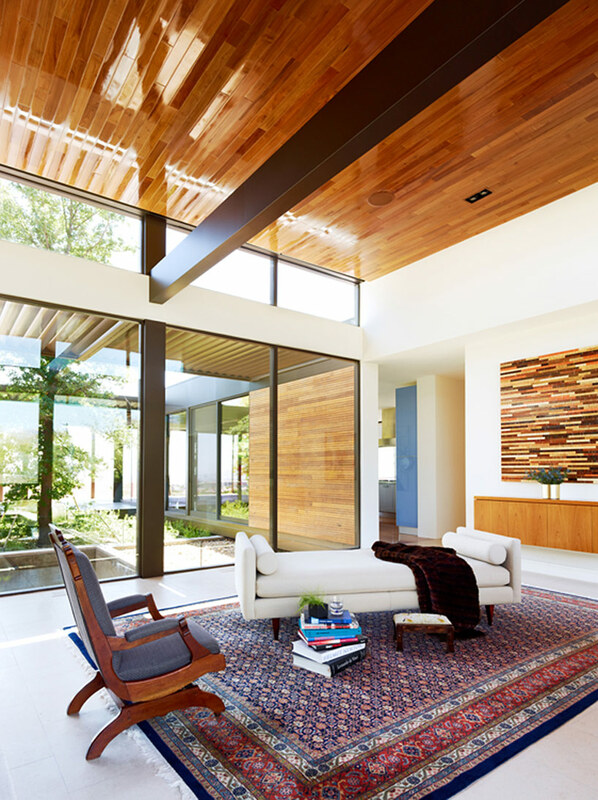 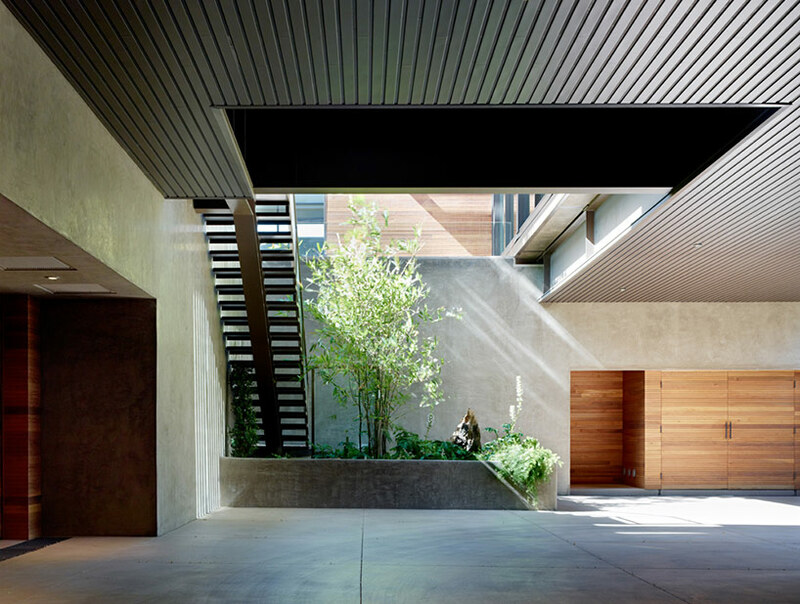 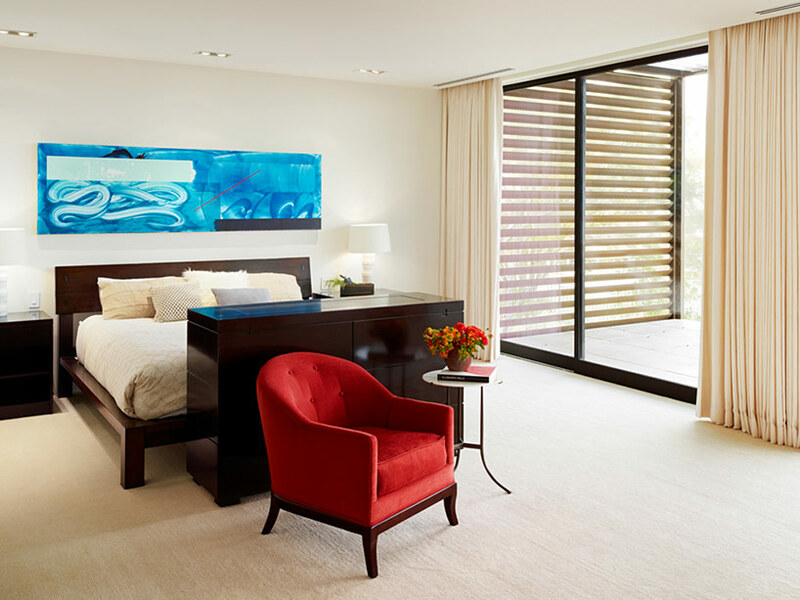 the use of 12′ by 12′ modules was not only a cost effective solution for the construction but also provided marmol radziner to play with indoor and outdoor spaces, consistently blending both throughout the house. 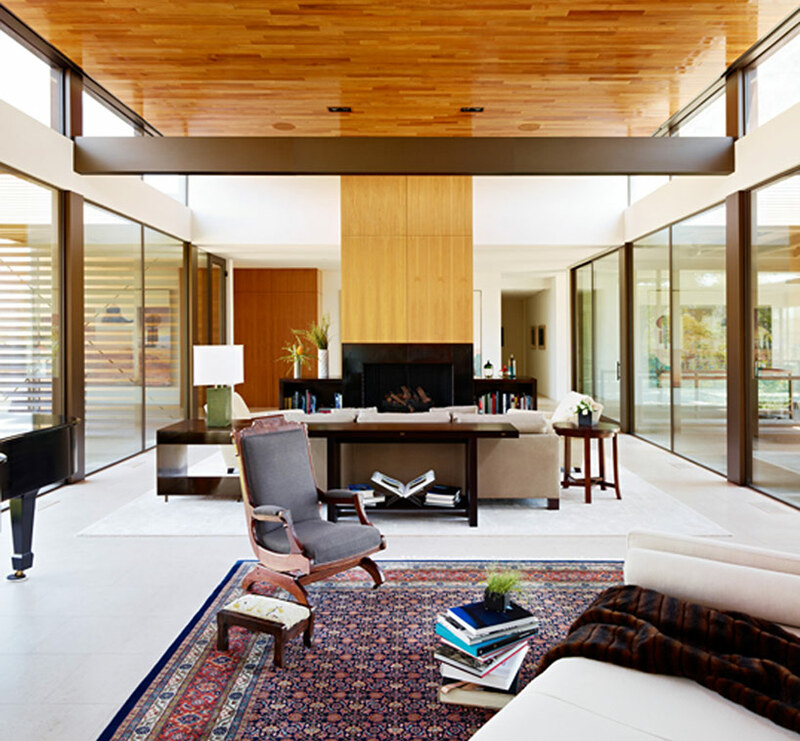 the U-shaped floor plan with two parallel wings bridged by a glass-clad entry hall. 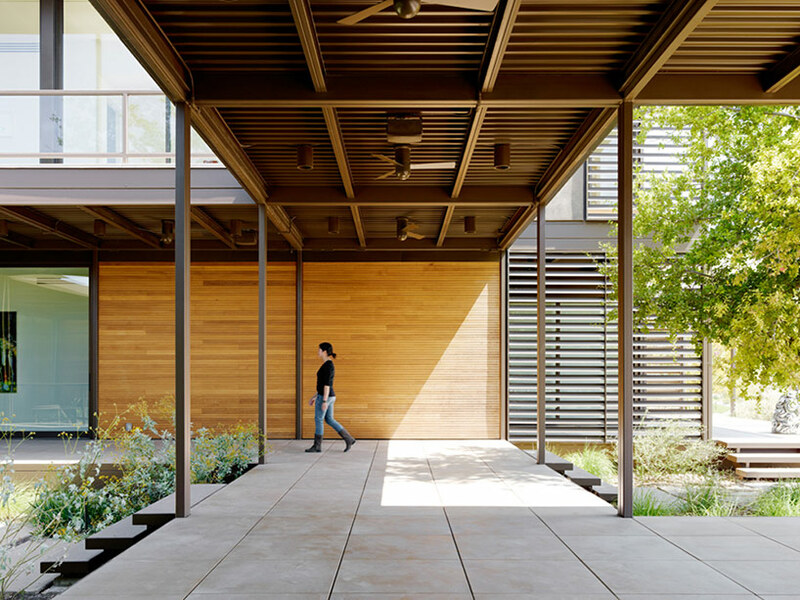 a tiled deck spans out onto the site defining a large central courtyard that ensures natural light and ventilation to every room in the house. 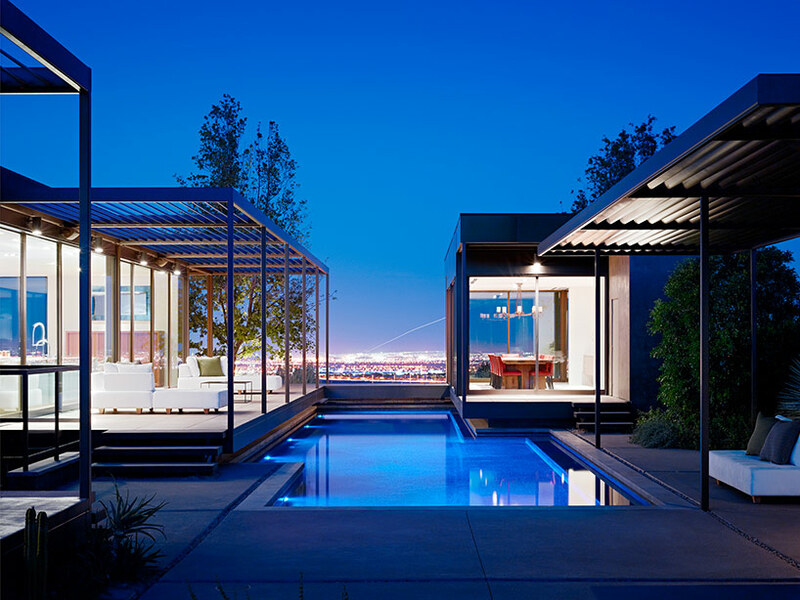 the exterior metal modules extend from the thermal envelope of the structure, with louvered roofs that cover the outdoor terraces and function as expansive shading devices for the glass walls. 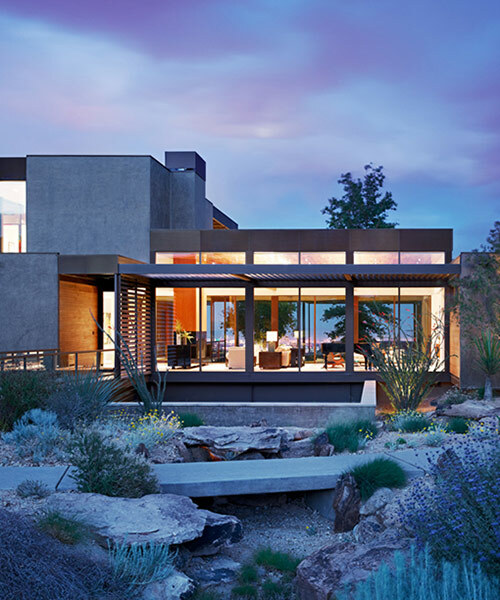 the living area combines a standard 12′ module with another partial module making 15′ tall ceilings that embrace the desert environment’s expansive views. 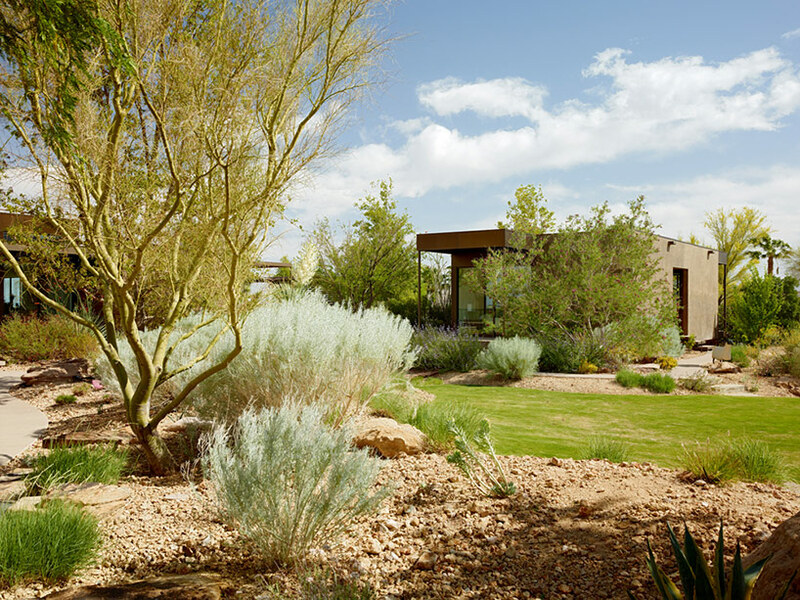 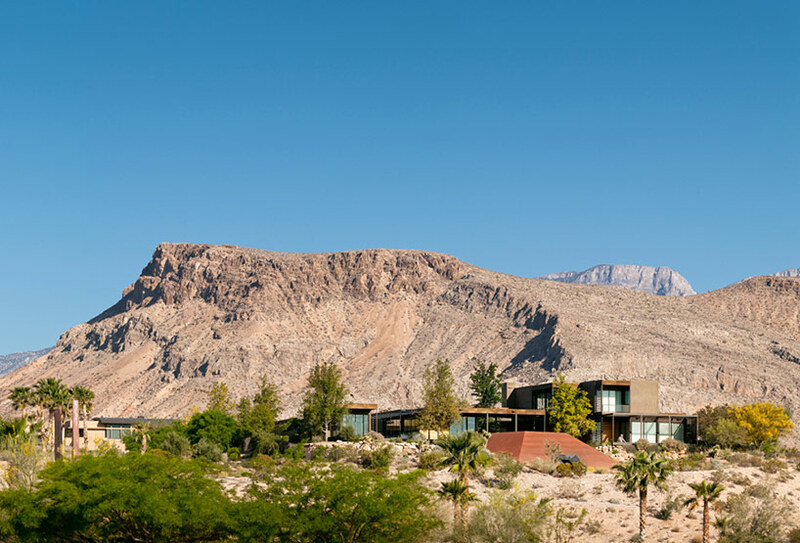 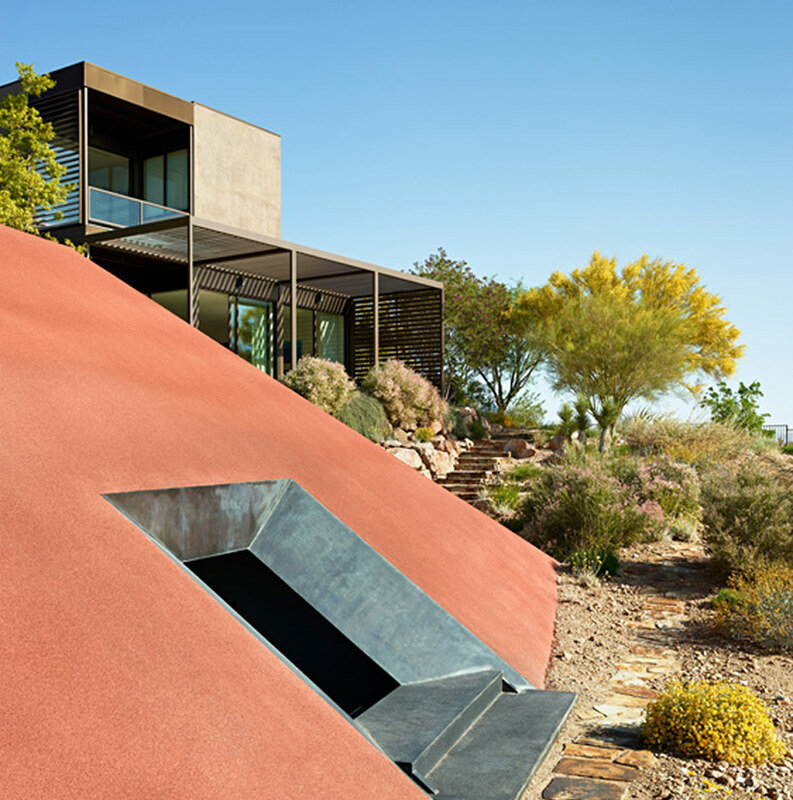 earth-tone finishes including stucco and metal root the structure into the land accentuated by the desert flora.